Satya(Allu Arjun) and Deepthi(Kajal Aggarwal) are lovers who decided to get married but Veeru Bhai(Rahul Dev) who also falls for Deepthi opposes Satya love. One day Veeru Bhai attacks Satya and Deepthi then what happens to Satya and Deeepthi? Who is Ram Charan?Who is Sai Kumar? Who is Jaya Sudha? That should be watched on screen. Ram Charan performance in movie is out standing. Especially he enthralled fans with his dances in ‘Freedom Song’ which are treat to watch and his body language is impressive in the fights.Ram Charan scenes with Jayasudha and Sai Kumar are extraordinary. Allu Arjun and Kajal did justice to their decent cameo and their role is vital to the main plot. Allu Arjun and Kajal made their presence felt. Kajal was beautiful in Cheliya Cheliya song. Shruthi Hassan looks beautiful and gorgeous but she was limited to songs only there is no scope for performance in her role. Amy Jackson was wasted there is no significance for her role but she was glamorous in one song . Sai Kumar was Powerful and his dialogue delivery was extraordinary. Jaya Sudha and LB Sri ram were impressive. Sai Kumar ,Jaya Sudha,LB Sri Ram are big assets of second half. Kota Srinivas was apt. Brahmanandam was just ok. others did justice to their roles. Vamsi direction is superb but he has taken some points from other popular movies which is clearly visible .The screenplay of the movie is gripping. The main asset of the film is the cast performances be it the leads or supporting cast like Sai Kumar, Jayasudha ,LB Sriram are perfect. First half an hour and interval Bang are superb. In first half audience may feel little bit bored with scenes involving Amy Jackon. Their is no complexity in screenplay which can be understood easily as it revolves around two different stories with no common element. Dialogues between Ram Charan and Sai Kumar , Jayan Sudha and Sai Kumar are out standing in second half. When compared to first half ,second half is good with no boring element. Unlike vamsi previous movies there is very less comedy in this movie though brahmanandam is there he is not used fully. The back bone of the movie is DSP music all song are good and neatly pictorised ,DSP BGM makes movie more interesting. Action sequences are feast for mass and action lovers.Editing is good. Cinematography is superb. Ram Charan’s Yevadu is the true Sankranti Winner. When compared to his previous hit movies like Racha and Nayak this movie is too good . 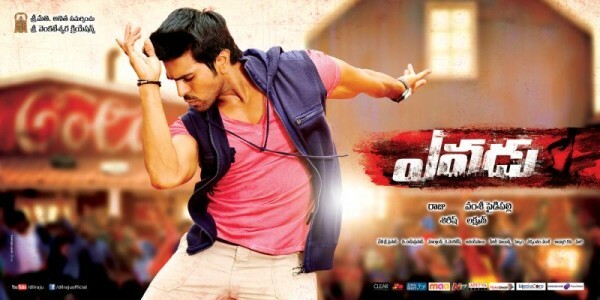 Yevadu is feast for mega fans and action movie lovers for this festive season.